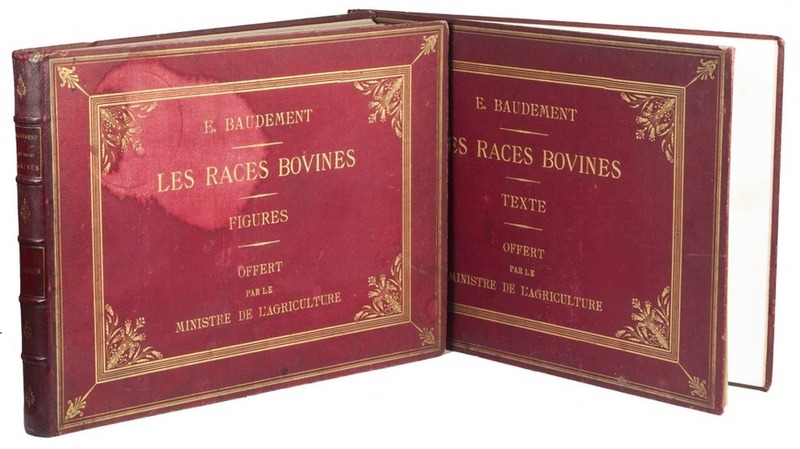 Les races bovines. 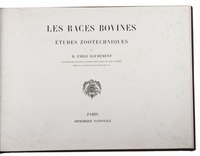 Études zootechniques. 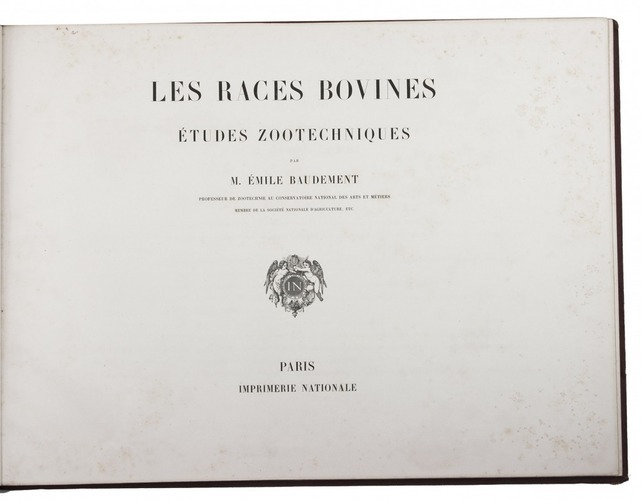 Paris, Imprimerie Nationale, . 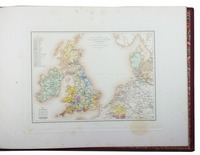 2 volumes (text & plates). 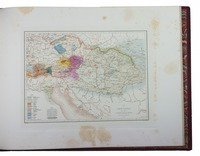 Oblong folio (36 x 49.5 cm). 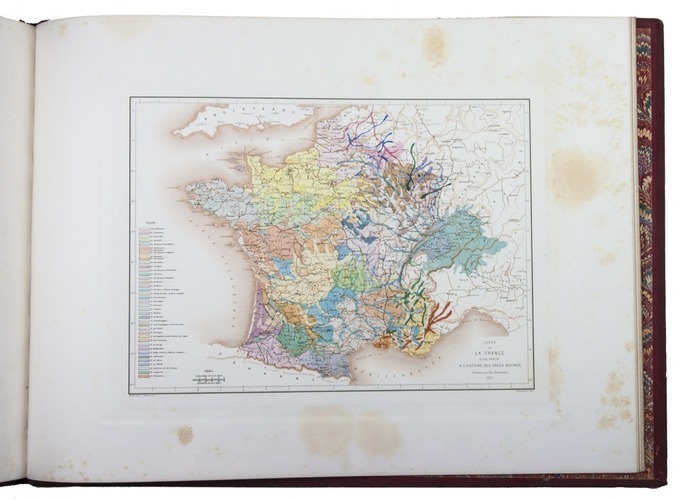 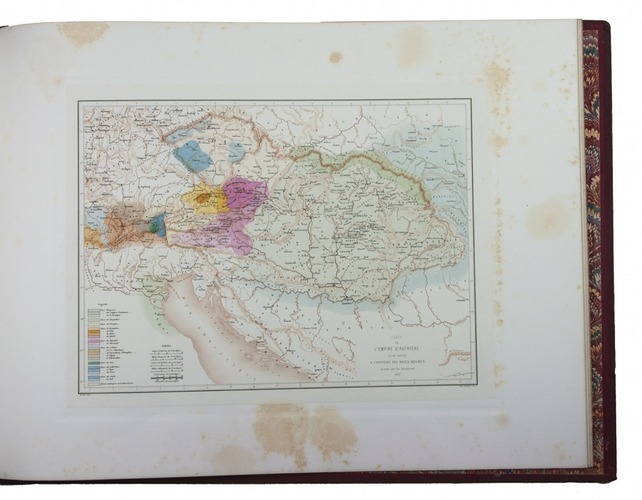 With 5 hand coloured maps and 87 numbered plates. 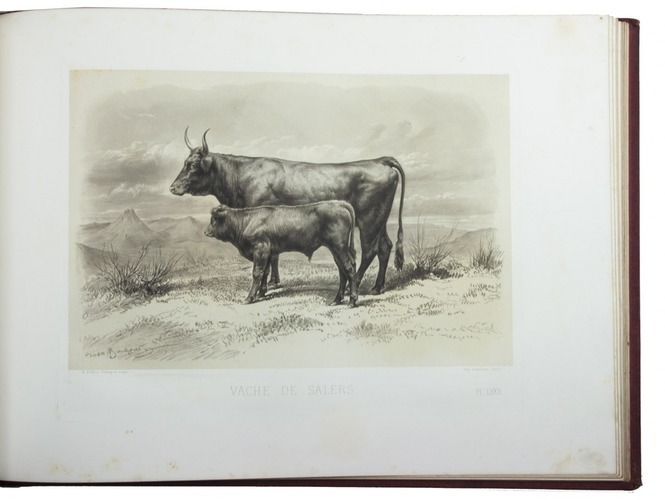 Contemporary red half morocco, gold-tooled spine, gold-blocked boards with the note "offert par le Minstre de l'Agriculture", gilt edges. 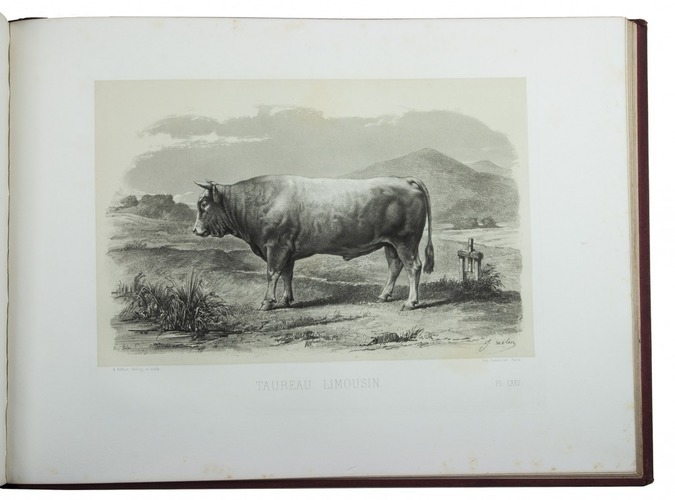 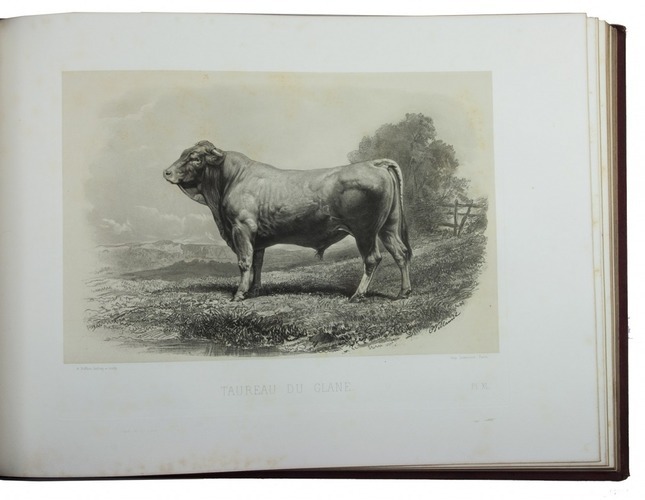 Presentation copy of one of the most beautifully produced works on cattle, by the "zootechnician", Émile Baudement (1810-1864). 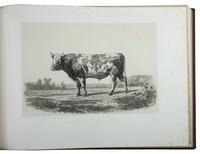 The 87 plates of bovine animals are arranged by origin, each region with its own part-title: England, Holland and Denmark, Switzerland and Germany, (the empire of) Austria, and France. 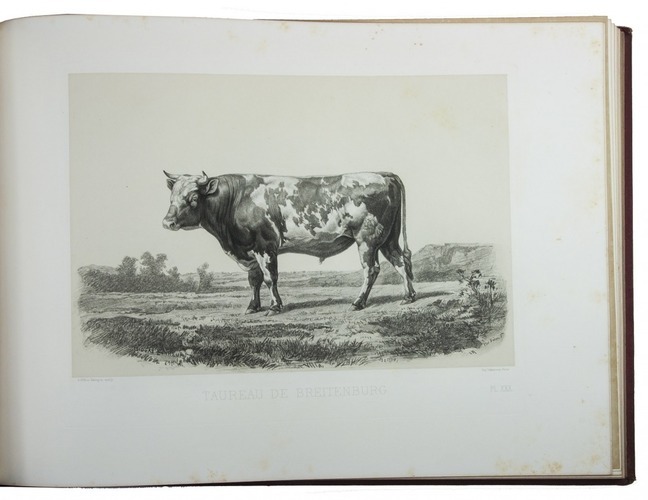 Many of the excellent plates are after photographs by Adrien Nadar. 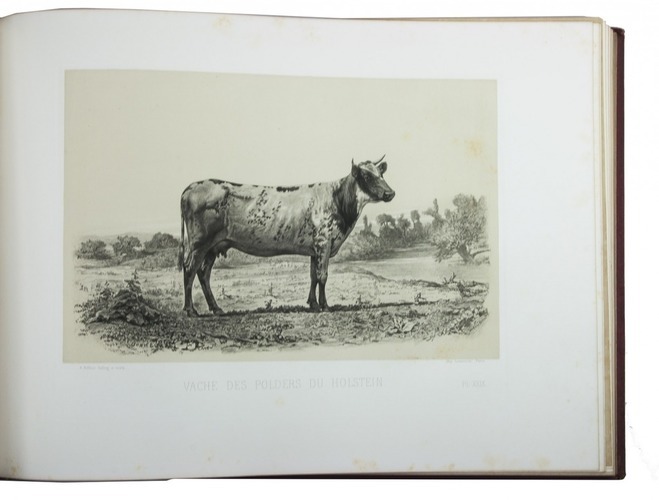 Artists like Emile van Marcke, Isodore Bonheur and Barye contributed to this work. 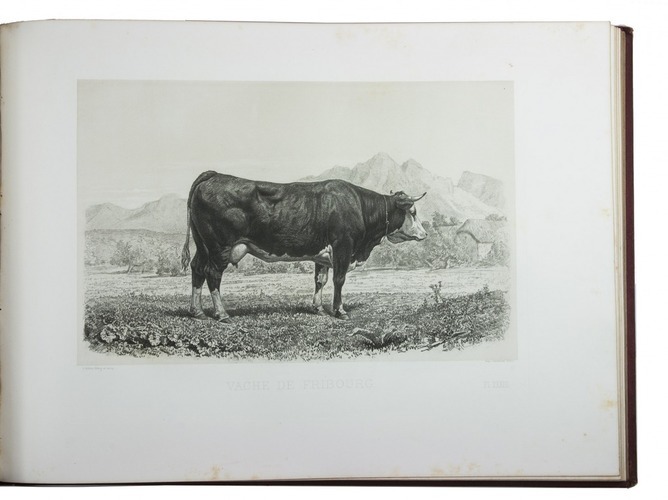 "The plates were produced by a mixed process of photographic transposing on to a metal plate (heliography) followed by handwork of various kinds - soft ground etching, mezzotint and aquatint, the background tint being achieved by lithography" (Boalch). 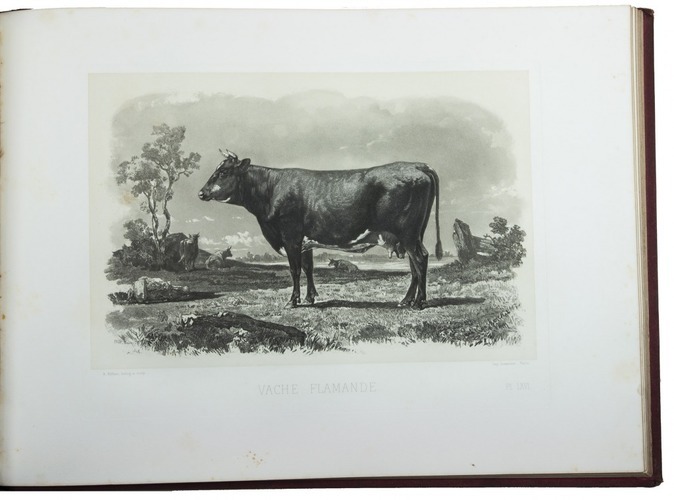 While regular copies are bound in green half roan, with plain cloth sides, the present set is bound in red half morocco, with gold-blocked red cloth sides with the note "offert par le Minstre de l'Agriculture". 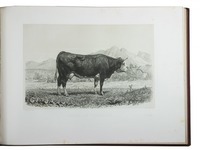 All copies include a preliminary "rapport" on the work by this ministry on two letterpress pages. 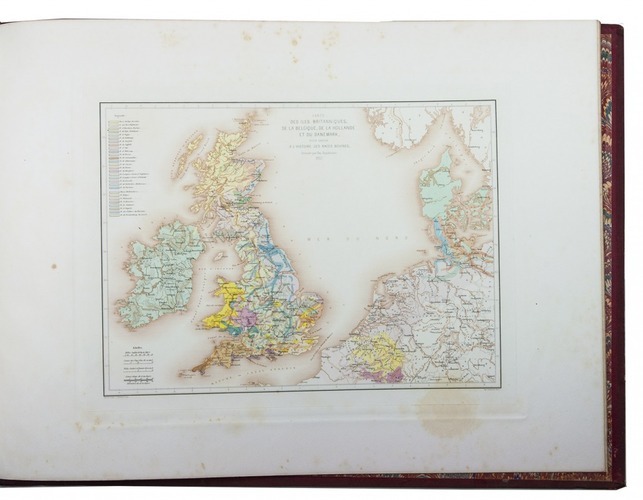 Some minor, professional restorations to the spines and the atlas volume with a discolouration and an endleaf partly detached. 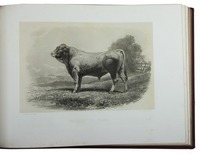 Some occasional foxing, but otherwise in very good condition. 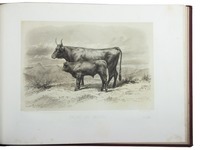 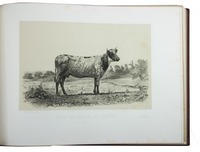 D.H. Boalch, Prints and paintings of British farm livestock; Nissen, ZBI 257.